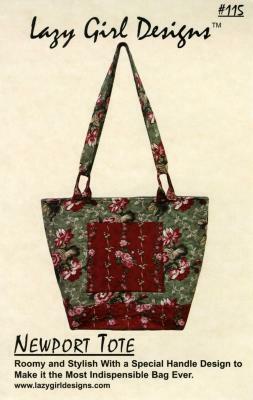 The Newport Tote bag pattern pattern makes a roomy and stylish bag that will quickly become one of your favorites. The unique handle & loop design allows you to carry the bag a number of different ways. The fully-lined bag is quilted and has inside & outside pockets. Finished Bag size is 18" wide across the top of bag, 13.5" high from top to bottom edges & 6" x 12" rectangle. Optional: Use Lazy Girl Bag-E-Bottom Size 'D' to give your Newport Tote a wonderful sturdy base.